With its elegant narrow streets, colourful traditional Maltese balconies, baroque architecture, rich history, stunning beaches and tales of knights, Malta will quickly whisk you away to another world. It may be best known for the fact that it gets more than 300 days of sun per year, but there is so much more to this tiny Mediterranean island than sitting on the beach. Luckily, Malta is a small island, so it can be easily be explored at a relaxed pace over 3-4 days. Here's a quick guide of the places you have to visit while you're there, the foods you should try, how to get around and where to stay in Malta. 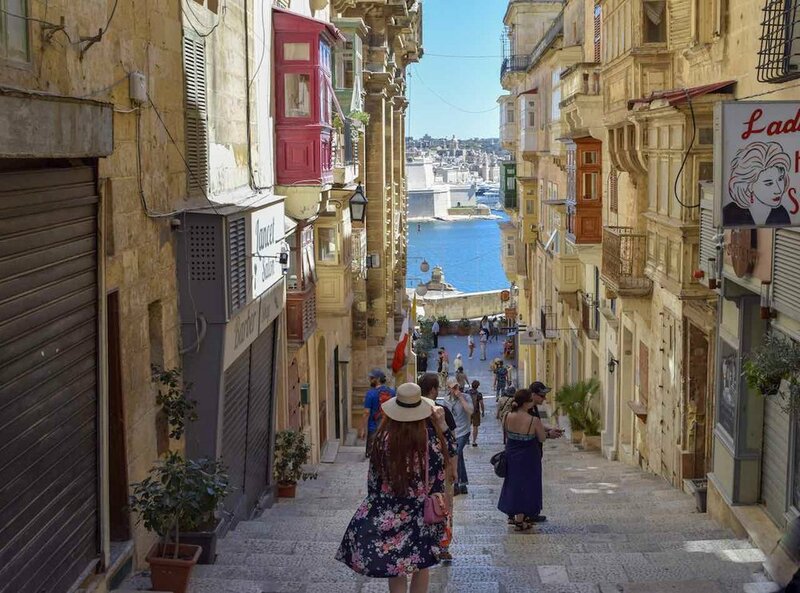 Built on one of the island’s peninsulas by the Knights of St John in 1566, tiny Valletta is only 1km long and 600 metres wide, making it the smallest capital city in the European Union. But what it lacks in size, it makes up for in stylish sophistication and culture. In fact, this year the UNESCO heritage listed city is the European Capital of Culture. Take the perfect photo: for an iconic shot of the church that is synonymous with the Valletta skyline, Madonna tal-Karmnu (Our Lady of Mount Carmel), head inland to the west side (towards the Triton Fountain) of the Zekka Street (Triq Zekka). 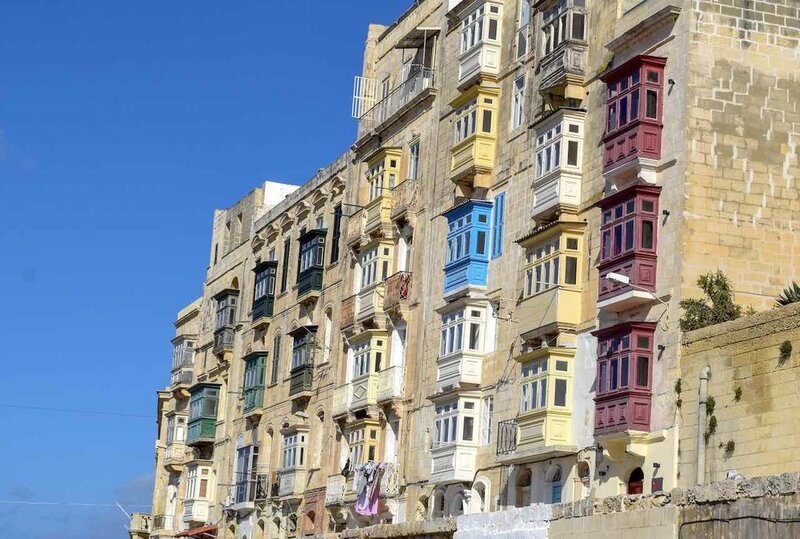 Check out the unique architecture: count the traditional, colourful, wooden, enclosed Maltese balconies wherever you go. For an iconic shot of you walking towards the water surrounded by some of the prettiest colourful balconies in Valletta head to Triq San Gwann (plug Cafe Society into Google Maps as it’s on the street). Get spectacular views: visit the Upper Barrakka Gardens for a panoramic view of the Grand Harbour and the Three Cities across the water. If you head there at midday or 4pm, you’ll be able to watch a cannon being fired from the saluting battery below. The cannons were traditionally used to protect the harbour against naval assault but later became a way to signal the exact time to ship masters, allowing them to recalibrate their chronographs on board. Afterwards I can recommend stopping off for ice cream at Gelato Dal Doge Valletta, which sits just outside the gardens. Have a drink: stop by for a choice of more than 200 gins at Yard 32. This bar isn’t cheap, but we had so much fun here we missed the last night ferry back to Sliema where we were staying. I’d suggest heading along to try at least one of their many different gin cocktail creations. Go back in time: get a dose of history with a visit to Malta’s most famous street, Strait Street. This street, which is called Strada Stretta in Maltese, was well known for its nightlife amongst Maltese locals, as well as American and British military men in late 1800s up until after WWII. While it’s lost its party edge, its faded charm still attracts tourists to this day. Malta’s mysterious ancient walled former capital is one of its most interesting cities. Mediaeval Mdina dates back as far as 4000 years and is so well preserved today that it’s been the backdrop in multiple movies and TV programs including Game of Thrones. Like Valletta, Mdina’s winding, honey-coloured sandstone streets are best explored without a plan, but if you’re a GoT fan make sure you take note of the city gate (pictured above), which you’ll recognise as the entrance to King’s Landing and drop by Mesquita Square to see Petyr Baelish’s balcony where the fight between Jaime Lannister and Ned Stark broke out. Where to eat in Mdina: If you want to stop for lunch, both Fontanella Tea Garden and Coogi's Restaurant have stunning sweeping views on inland Malta – if you’re lucky enough to snag a seat outside. After visiting Mdina, I’d recommend walking the 7-8 minutes towards Rabat to see St. Paul’s Catacombs. These are the largest catacombs in Malta and are interesting due to the wide variety of tombs – including Christian, Jewish and Pagan. Particularly on a hot day, the catacombs also provide some respite from the sun. The first thing that comes to mind when I think about the traditional fishing town of Marsaxlokk in Malta’s southeast is colour. This has to be one of the most vibrant places in Malta, thanks to its harbour full of brightly coloured boats called Luzzus that bob around on its turquoise water. 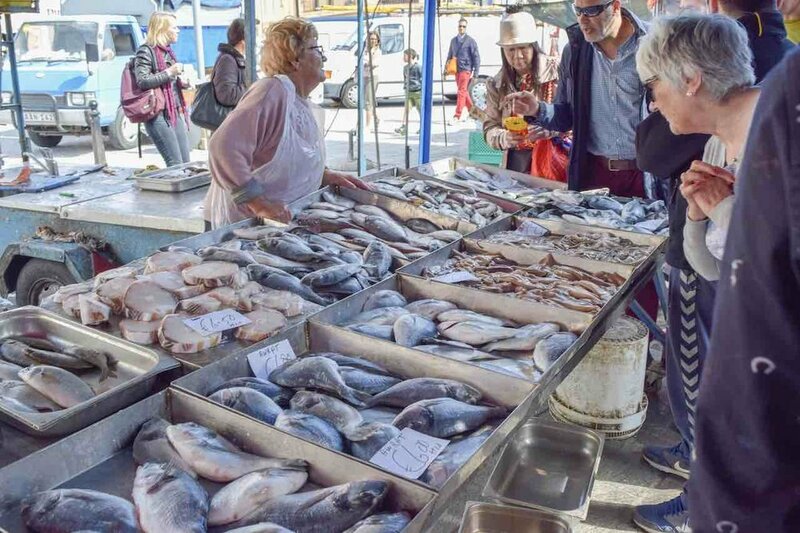 While many travel guides will tell you to visit the town on a Sunday to experience its famous fish market, I’d recommended visiting on another day to avoid the crowds. We visited on a Sunday and these days the fish market seems to be more of a tourist trap than anything else, where local sell overpriced souvenirs and it’s so busy you can barely move. From Marsaxlokk you are about a 30-minute scenic (but slightly hilly) walk to one of Malta’s prettiest swimming spots: St. Peter’s Pool. Ignore the roundabout way Google Maps directs you and follow the signs instead. When you get there, sparkling azure waters will greet you. And if it’s warm, plenty of tourists and locals alike will be sprawled out on the rocks surrounding the pool and daring each other to jump in. A trip to Malta would be incomplete without jumping a ferry and visiting its islands of Gozo and Comino. In Gozo, you can visit the capital of Victoria (also confusingly known as Rabat) where you can visit its Citadel (fortified centre), which dates back as far as 1500 BC. Strategically placed on a hill, the citadel also provides sweeping views on the island. There are a few options to do this. If you have a car you can drive up to Ċirkewwa and catch the ferry across. If you don’t have a car, like we didn’t, you can either make your way up to Ċirkewwa by bus or cab/Taxify (more about this below), and catch the ferry across, or you can go on an organised boat trip from Sliema. We chose the second option, which was a good way to see Gozo’s highlights and to visit the Blue Lagoon all in one day, but in general the tour was a bit lacklustre so I wouldn’t wholeheartedly recommend. Some tours take you to places you want to go, while some immerse you in the culture. In this case it’s definitely the former. The Blue Lagoon on Malta’s tiny Comino Island, is one of the most beautiful spots in the country, thanks to its crystal clear turquoise waters. This is a must see while you’re in Malta – but be warned – it gets extremely busy. Don’t let that dishearten you though, because it means you’ll have the rest of Comino to yourself. So once you’ve checked out the lagoon go for a wander for beautiful visits of less crowded crystal clear waters. Get the best views of Valletta's skyline: these views are easy to find: when facing the water at the Sliema ferry terminal, turn left and walk along the water and watch Valletta’s skyline expand as you get closer. Where to eat in Sliema: They may not be particularly associated with Maltese cuisine, but you’ll find delicious and beautifully presented éclairs at The Pastry Park in Sliema. These were so good we went there multiple times during our stay. Take a boat tour of the Grand Harbour: As Sliema is popular with tourists, this is also the perfect spot jump on a one-hour boat tour of the grand harbour. These cost around 8-10 euro per person and are a great way to learn about and see the Three Cities (Vittoriosa, Senglea and Cospicua) up close if you don’t have the time or don’t plan to visit them. Visit the Roman baths: despite their name, this swimming spot apparently doesn't date back to Roman times, but on a warm day, it's a perfect spot to have a swim. St Julian’s is by far one of the most popular spots for tourists to stay while in Malta. If you’re not staying there, I recommended visiting its well-known Spinola Bay at dusk for beautiful views. If you’re staying in Sliema, this is a 25 minute walk. Where to eat in St Julian’s: If you’d like to escape the hoards at night, I recommend heading to Italian restaurant Piccolo Padre about a 15 minute walk from Spinola Bay, which has a balcony that overlooks Balluta Bay for dinner. The food is delicious, the service is friendly – but the views of the water are what make this place extra special. Twistees: these cheesy snacks are an institution in Malta and a must try for any tourist. You can buy them from the supermarket. Pastizzi: you cannot go to Malta without trying Pastizzi (pictured below) – a traditional savoury pastry snack filled with either ricotta or mushy peas. These are sold at bakeries for as little as 40 euro cents. Ġbejniet: delicious little round cheeses made from local sheep milk, which tastes a bit like ricotta. Fenek Bit Tewm: traditional braised, slow-cooked rabbit with garlic and white wine, generally served with chips and salad. Lampuki Pie: a Maltese fish pie prepared with local lampuka fish. Soppa tal-armla (widow’s soup): a hearty soup often served with a poached egg or ġbejna. Bragioli: savory stuffed beef rolls braised in wine. Timpana: baked macaroni pie – so good but so unhealthy! For a short trip to Malta I don’t recommend hiring a car; you just don’t need it. I did quite a lot of research on whether or not to hire a car for Malta. As we were only going for a short time we decided not to. We planned to use the buses, which I’d read were great, but we found them somewhat unreliable and packed. I’ve never seen old people move as quickly as the Maltese elderly did to push people out of the way to ensure they boarded the bus first and got a seat! So I personally wouldn’t rely too heavily on buses while in Malta. Use Taxify: if you choose not to hire a car, but still want to visit different places across the island without relying on buses, I’d highly recommend downloading the Taxify ride-sharing app. This is a lot like Uber, and will prevent you from getting ripped off by taxi drivers (which is apparently a common occurrence in Malta). 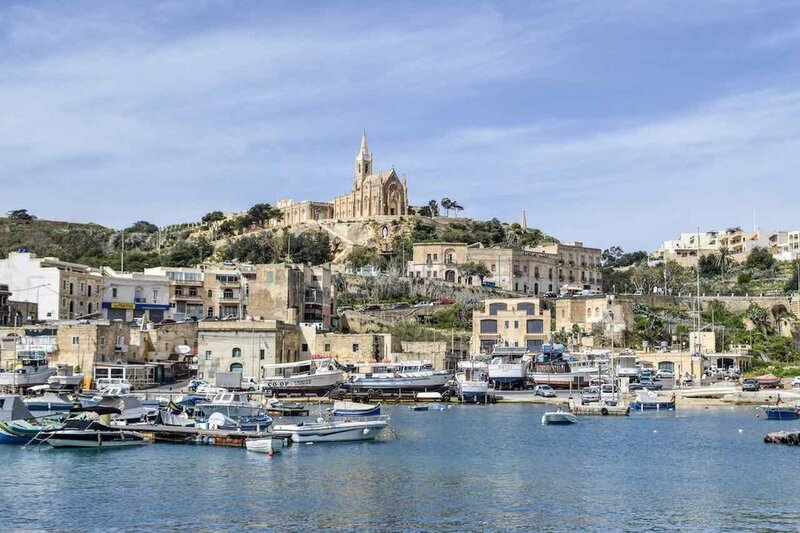 A return trip from Sliema to Mdina with Taxify was €28, as was a trip form Sliema to Marsaxlokk. While this is far more expensive than a bus in both instances it saved over an hour of travel each way and was cheaper (not to mention far less hassle) than hiring a car for 4 days. Ferries between Sliema and Valletta run regularly and are great – just make sure you check the timetable to ensure you know what time the last one goes if you’re having dinner as they finish quite early outside peak times. In my opinion, the best places to stay in Malta are Valletta, Sliema and St Julian’s. We stayed in Sliema, which as I mentioned earlier isn’t the most beautiful spot but due to its central location, it is the perfect launch pad to explore Malta. As Valletta and St Julian’s are both central as well, they are great for the same reason. Next time I visit, I’ll most likely stay in Valletta, as it is my favourite city on the island.